The Jenks Public Schools District is facing financial difficulties due to decreased state funding. For the 2015-2016 fiscal year, the JPS Board of Education and Administration have dealt with a reduction of $558,076. What’s worse? Projections for 2016-2017 show significantly more budget cuts of approximately $3.7 million. 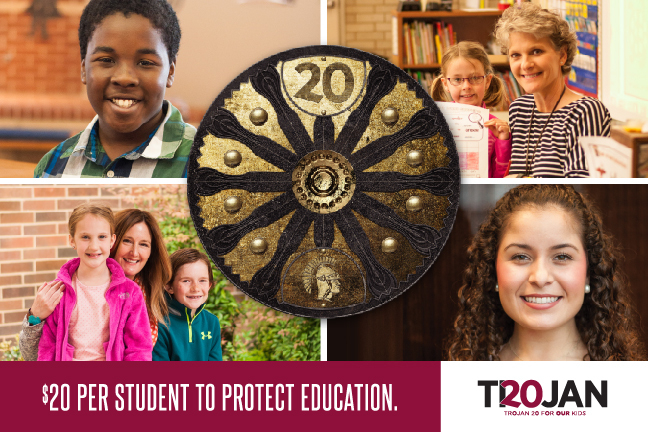 The Jenks Public Schools Foundation is partnering with the District to launch Trojan 20—a new fundraising campaign designed to cultivate small donations on a large scale. The fundraising goal is to raise $20 for each Trojan student that attends JPS. Funds raised will support instructional budgets—specifically school site budgets, instructional supplies and equipment, and professional development for instructional staff. Be a part of the solution and click the Donate link below to make your contribution to the Trojan 20 campaign or you can text Trojan20 to 77977. Donations will also be accepted at school sites or by mail: Jenks Public Schools Foundation, P.O. Box 595, Jenks, OK 74037.